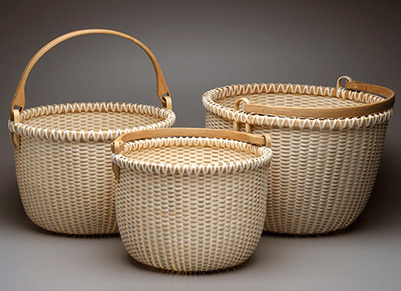 These beautifully uniform nesting sets of swing-handled baskets are superior for display or collecting. Choose between the large sets, practical for multiple uses, or the eye-pleasing gracefulness of the miniatures. In any size, these carefully detailed baskets have individually fitted whittled handles and are woven using only the finest splints. A nesting basket set is sure to be a welcome addition to any collection. *Sizes are approximate and do not include height of handle. Nesting sets must be ordered together.